This really is an invaluable tool to have if you want perfect flat cupcakes everytime! Our ice cream scoop will "plop" into your cases the perfect amount of cupcake batter to ensure you get perfect cupcakes every time. This scoop works perfectly with the cases we use and sell in the online shop. A flat amount of batter will give you a flat cupcake. 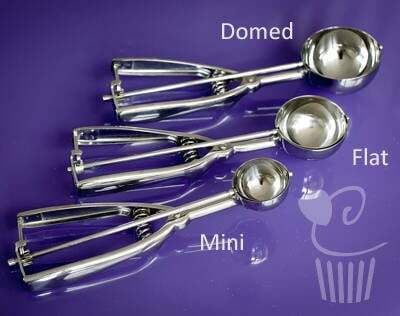 If you prefer a domed effect, use the scoop for domed cupcakes. This scoop is also the perfect measuring tools for use with the Baby Victoria Sponge Tins.